@70: Celebration of Contemporary Palestinian Culture, taking place from the 14-20 May, is a week-long festival of theatre, dance, films and talks commemorating the Palestinian experience of dispossession and loss of a homeland. Every year on May 15, Palestinians around the world, numbering about 12.4 million, mark the Nakba. 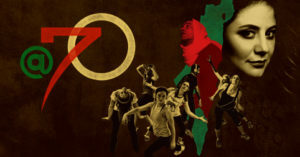 Three artists from Gaza – Ahmed Masoud, Ahmed Najar and Khalid Ziyada, have worked closely with Amnesty International UK, the Hoping Foundation, Amos Trust, the Palestine Solidarity Campaign and Al Zaytouna Dance Theatre to bring together this creative response to decades of injustice. Al Zaytouna Dance Troupe in collaboration with Hava Dance Group present Project 51, written and directed by Ahmed Najar. Project 51 – the Israeli war on Gaza in summer 2014 lasted 51 days- questions the unequal media coverage of conflicts and terrorism, and critically challenges the given perceptions of the Palestinian struggle through the western media. The play centres on a Gazan man trying to distract his daughter from explosions and the sound of drones and military aeroplanes. Creatively using the power of the traditional Palestinian folk dance ‘Dabke’ and blending it with modern dance and theatre – this typically inclusive, infectious and widely popular dance form is used in a satirical way bringing an eruption of joy and an affirmation of individuality and belonging. Ahmed Najar is a Palestinian director, playwright, dabke expert and co-founder of the Al-Zaytouna dance troupe. The company fuses traditional Palestinian folk dance (dabke) with contemporary dance, theatre, poetry, music, and digital media to create inspiring pieces of dance theatre to tell powerful stories about Palestine, often focusing on identity and cultural resistance. As well as a being a regular dancer with the troupe, Najar has also written and directed several productions. He wrote Between the fleeting words, which toured the UK and Europe in 2011. Najar took dabke teaching abroad when he worked with the Hava dance group in Slovenia (2014), writing and directing Water and Salt (Slovenia 2015) and Project 51 (London 2016). Renowned Palestinian singer Sana Moussa’s work is a tribute to Palestinian women’s folklore and a celebration of indigenous traditions in the face of occupation and globalization. Raised in a musical family hailing from Deir El Assad in the Galilee, Moussa could not help but develop a passion for traditional Palestinian sound from a young age. Moussa’s first album Ishraq was released one year ago and she has subsequently toured Palestine, Jordan and Cairo before coming to London. Remarkably, Moussa is simultaneously pursuing her PhD in Microbiology. This 1947 British colonial propaganda film shows how the British government sought to present its role in Palestine at the very end of the Mandate period. Using archival documents to tell the full story of the film’s production, this presentation will show the forces at work in the creation of colonial film propaganda at the end of Empire. A rare chance to see fascinating footage from the British colonial era. Presented by writer and researcher Francis Gooding, who will present a close reading of the archival records, in order to unpick the imagery produced, and the motivations behind the making of the film. Director Azza El Hassan chronicles her journey on the trail of films made by the PLO Media which went missing during the Israeli invasion of in Beirut in 1982. The films were supposed to show a self-determined image of Palestinians from the moment of civilian expulsion in 1967 to PLO activity in Lebanon continuing until 1982. Through the narratives of individuals who El Hassan feels can assist in her search, the film touches on several aspects of contemporary Palestinian life. She travels through Syria, Jordan and Lebanon searching for clues as to where the lost archive might be. The increasingly absurd search leads her to where the films are said to be buried – but no one wants to dig them up. The film reflects the situation in the Middle East; a failed revolution, the problematic relationship with the Arab neighbours and the question of a Palestinian identity today. Azza El-Hassan is an award-winning Palestinian filmmaker. Since launching her film career in Ramallah, El-Hassan has now become one of Palestine’s most promising female directors. She has produced several works all of which reflect the different stages of her journey exploring her complex relationship with her Palestinian identity. Her films include Always Look them in the Eyes (2007), Kings & Extras (2004), 3cm Less (2003), News Time(2001), The Place (2000), Sinbad is a She (1999), A Title Deed from Moses (1998) and Arab Women Speak Out (1996). You can book for single events or for everything on that evening (i.e. a double bill).